Roll your eyes at your own risk. Selfies are more mainstream than Millennial fad, according to a survey from Coyne PR. NEW YORK: Though often mocked as a Millennial trend or a sign of vanity, most people are not bored by the selfie phenomenon, according to a study released Thursday by Coyne PR. The State of the Selfie Report, which surveyed the firm’s influencer panel last month and includes 778 responses, found that more than half of respondents are entertained by selfies on their social media feeds. Eighty-five percent said they take selfies themselves, and most post a selfie on social media once a week. Facebook was cited as the number one spot for posting selfies, but Instagram came in a close second, according to the survey. As for why people take selfies, 82% explained that they do so to show off something new, like hair, makeup, or clothing. Other reasons include highlighting spending time with their family, visiting new places, or working out. 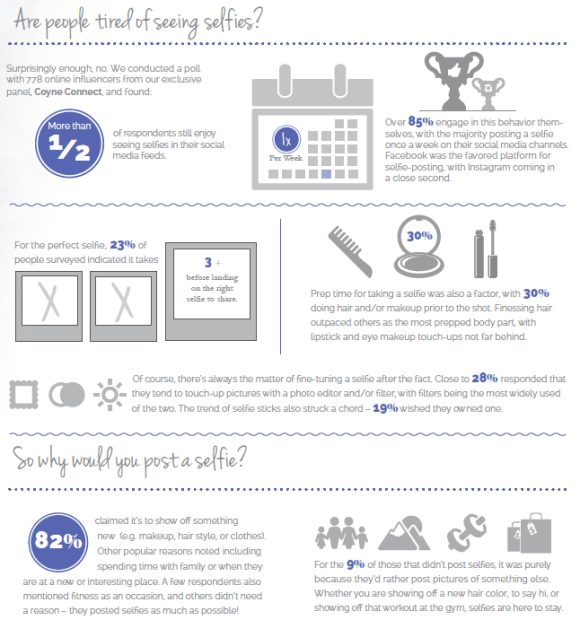 The 9% of respondents who do not post selfies explained that they’d rather post photos of other things. 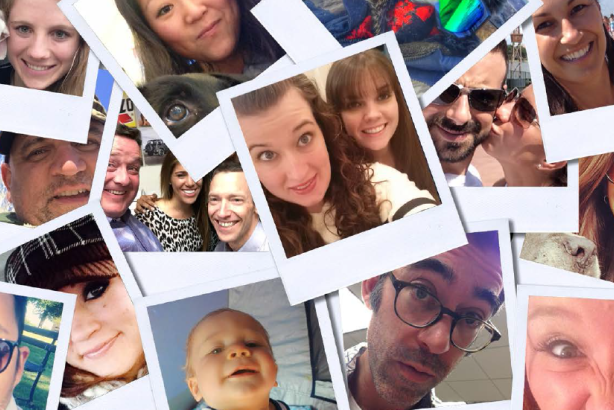 With about 900 brands running selfie-focused contests concurrently, and more than 93 million taken each day, according to Corbis and Google, respectively, cutting through the clutter to find good uses for them can be a challenge for marcomms pros. Marie Baker, VP of social media at Coyne, said brands should follow selfie trends closely to find relevant ways to leverage them on social media. For example, one current trend is the "hand selfie," which could be an opportunity for a lotion brand to do a contest to find the smoothest hands based on selfie submissions. And rather than just doing the usual "submit your best selfie for a chance to win" contest, Baker said it is important to find a unique angle that fits a brand. Another creative way brands can use selfies is as a form of currency or coupon. Coyne has worked with its client Peeps & Company on the "sweet selfie," which encouraged customers in the brand’s retail stories to take a selfie in front of their favorite candy for a discount at the register. Baker explained that the initiative has been Peeps and Company’s most popular promotional revenue driver, even higher than couponing or street marketing. "You can take something, and it doesn’t have to be complicated, and make it ownable enough where your brand stands out and benefits," she explained. Baker noted that social media influencers are very popular, including people who are "notorious" for selfie-taking, so partnering with bold-face names makes sense for many brands, especially those in the beauty category, said Baker. According to research from Ohio State University, adult men who post many selfies are more likely to show psychopathic or narcissistic characteristics than those who do not. Women tilt their head 50% more often than men when taking selfies, according to a Selfiecity.net study. The report also revealed that women tend to take selfies more than men – 61.6% more in New York City, in fact. Over the past year, the word "selfie" has been mentioned more than 154 million times across social media, according to Sysomos.